WHEN former president Robert Mugabe was swept away through a popular coup, the world celebrated the departure of an "evil dictator". 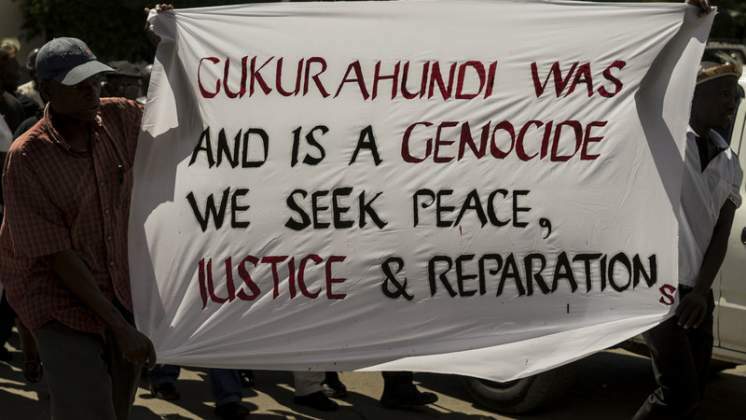 Many hoped for a fresh start but that dream remains elusive for victims of Gukurahundi, a dark phase in the country's history when an estimated 20 000 people were killed. Recently, deputy minister of Defence, one of Mnangagwa's top allies, Victor Matemadanda blamed the massacres on Mugabe's shoulders, but new documents and historical narratives point out that the Zanu-PF leader was just as complicit. Recently, declassified diplomatic cables by the United States' State department have pinned Mnangagwa and Zanu-PF for the Gukurahundi atrocities. Mnangagwa has refused to apologise over the atrocities which saw a government militia killing people mostly in the Midlands and Matabeleland regions saying "he cannot change the past". "Heinback said a committee of five persons representing twelve private voluntary organisations active in Zimbabwe had met with Mugabe on March 3 and had presented a full catalogue of Fifth Brigade atrocities. Mugabe had with him ministers Mnangagwa, (Sydney Sekeramayi and (the late Hebert) Ushewokunze. The PVO people found Mugabe's response less than satisfactory, as he recounted at length the history of Zanu-Zapu relations In effect to justify current policies," reads part of the cables. "During a cordial one hour courtesy call by Ambassador Miller on minister of State Security Emmerson Mnangagwa on June 18, Mnangagwa volunteered to be informal channel on important foreign affairs questions. He also castigated Zapu officials for publicly decrying dissident actions, but privately continuing their support to dissidents, implying that the government would continue and possibly extend its anti-Zanu-PF activities," read the cables. Mnangagwa was quoted in the cables saying these Zapu networks in the countryside "have existed forever" and they have to be exposed and "cleaned out. It is our duty to protect citizens and overall national security, regardless of what others think". Mnangagwa and his apologists have refused to take the blame for the sad chapter in the country's history placing the blame on the shoulders of Mugabe. Addressing a press conference early this week Matemadanda blasted Mugabe who stirred a hornet's nest last month when he accused Mnangagwa of using soldiers to kill innocent civilians. "Even though you may want to forgive the old man I do not think he deserves forgiveness because surely how can Mugabe have the audacity to tell Mnangagwa not to kill when he is the specialist in that area. "We survived by fleeing this country, Mnangagwa himself escaped death by a whisker, Mugabe is the known and approved killer, I think he should have said you are taking my job. "I once went to Matabeleland told chiefs to take cattle from Gushungo Dairies for him to appease the spirits of those he killed during the Gukurahundi; this is what is making Mugabe lose his senses," said Matemadanda. However, the man who dispatched Mnangagwa back in the 1980s insists his henchman was the one who went after the "dissidents". "... You know he (Emmerson Mnangagwa or ED) was the minister of Intelligence, he's the one with Stannard, the two of them, who led that (arms caches findings) and who even led Gukurahundi. I know one of the vehicles, (then Zapu/Zipra intelligence chief) Dabengwa's vehicle, which they blasted, they said he's carrying arms," said Mugabe. In his own words as captured by the State media, Mnangagwa said "Likening the dissidents to cockroaches and bugs, the minister said the bandit menace had reached such epidemic proportion that the government had to bring ‘DDT' (pesticide) to get rid of the bandits." Matemadanda's attempts to exonerate Mugabe's successor and former henchman Mnangagwa drew brickbats from the likes of former Higher and Tertiary Education minister Jonathan Moyo who revealed that he used his time in government to gather information on those who were involved in the massacres. "Only fools think we didn't access critical information on Gukurahundi when we were in government. A lot of critical information (including dockets) was collected and secured from 13 to 30 November 2017. Gukurahundi is so well-documented that the truth is known," said Moyo. "The deadliest force in the #Gukurahundi atrocities was the CIO, the lead. Directed by Mnangagwa, who administered the State of Emergency Act & liaised with exRhodie & apartheid killers, the CIO gathered ‘intelligence' through barbaric torture and murder on an industrial scale," said Moyo.